Day two, the 29th of March 2012, was one of the best days of my life! You see Thursday was the day I got to stand up in front of a packed out room and present my research. Needless to say, this simple fact completely changed my ability to take in the days activities. I arrived just in time for Rolf Reed's presentation on burns and frostbite. In the interest of honesty, I will admit that I took in about 5% of it. I've no doubt that it was a interesting presentation, but not really in any way relevant to me. The combination of this, and the fact my brain was already running at 100% doing practice runs of my own presentation, resulted in me clapping at the end simply because everyone else was. Sorry Dr. Reed, but I was just too nervous to take anything in. Or so I thought. Then a man that looked kind of like a Dr. Emmett Brown (back to the future) walked up to the mic for the next keynote presentation. Big white beard, with mad scientist hair to match. He hadn't opened his mouth and I was already sitting upright. The internal dialogue of my presentation had come to a screeching halt. This man had my full attention. You just knew he had something interesting to say, and that he did! Gerald Pollock's presentation on water was the best presentation of the entire congress. It was a presentation that would have been more at home on a TED stage, but I, along with the entire audience certainly wasn't complaining. Below is a similar lecture he gave a few years ago. It's almost a hour long, so I don't expect you to sit thought it now. But, I highly recommend bookmarking it. This really is ground breaking stuff, with such far reaching conclusions. Quite simply, this is everything I love about science. He also has two books out, the one I've just bought is called "Cells, Gels and the Engines of Life" and I cannot wait to read it. ....that's me, second on the list! And so my time had come. There were three parallel sessions on at the same time so I thought the crowd might spread itself thin. It didn't. Leon Chaitow was opening in the room I was presenting in, and to say he drew a crowd is a understatement. The room could probably seat a few hundred, and not only was every seat taken, but people were standing all around the perimeter of the room, the line even going out both doors. It was packed, with some of the top researchers and clinicians in the field making up the crowd. And so I said my bit, got my research across, and hopefully brought peoples attention to the need for research in the world of fascia and enhancing performance. It went down well, even getting a few laughs, as I think it was a very different from anything else that was presented. A lot of questions were directed toward me during the open Q&A section at the end which hopefully shows peoples interest in this area. 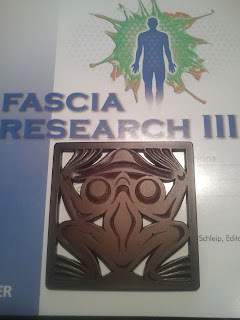 They even gifted me this cool first nations-style wooden frog as a thank you for presenting my research. Tons of people came up to talk to me after my presentation, so I effectively missed Karen Sherman's presentation on research and methods. Not the most exciting talk of the congress so I was more than content with chatting to other attendees as they gave great feedback and asked further questions. Day two of the congress ended with four multi-media presentations. The pick of the crop was another video by Jean Claude Guimberteau entitled "Interior Architectures: Exploring the Architectures of the Human Body". Yet again he used his revolutionary endoscopy techniques, tricked out with a HD camera, to take us under the skin. Crazy cool. 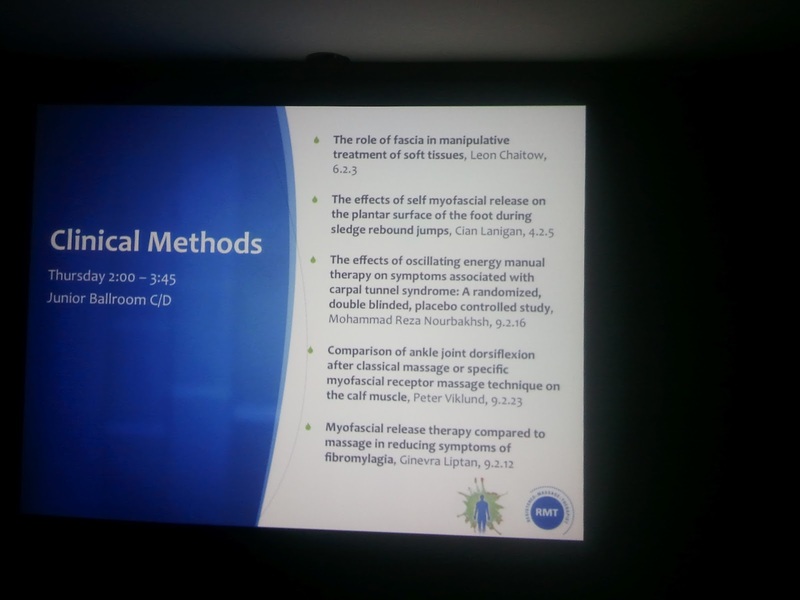 I left the congress on a high after witnessing a jaw-dropping presentation by Gerald Pollock, getting to present my own research, and having watched some insane footage taken from inside a human body. I didn't have to walk far until I was at the restaurant where my beautiful wife handed me a letter from immigration Canada saying my visa had finally arrived after a year of waiting!